July is National Grilling Month and it’s been a scorcher in Chicago. With all the BBQs and back yard grilling bonanzas this month, adding some veggie burgers to the mix can happify those who don’t wanna have a cow. Humans are naturally omnivores, meaning we’re down (and hard wired) for some vegging out. Plus, eating more veggie based meals can help the environment, reduce cancer risks, minimimize exposure to meat based antibiotics, and improve the quality of life for animals. But lettuce not forget taste! There isn’t mushroom for a bad tastin’ veggie burger on the grill. 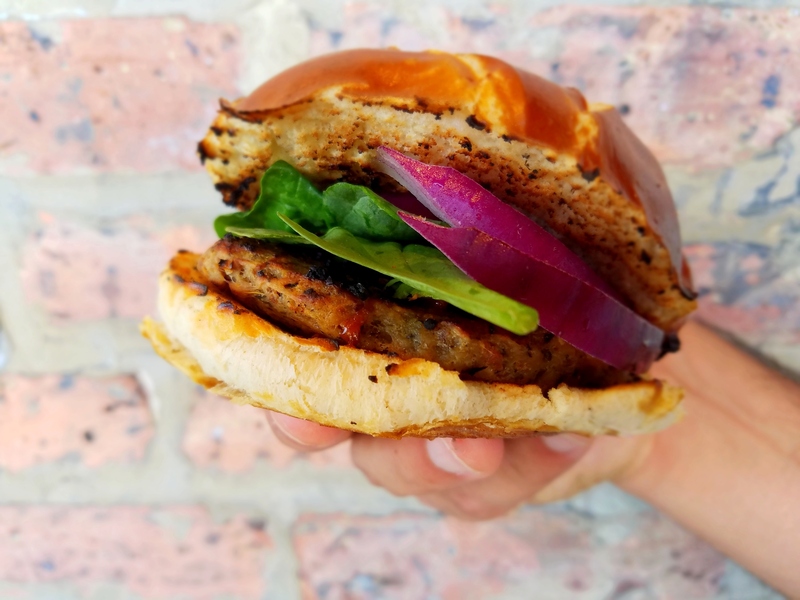 Upton’s Naturals, an independently owned Chicago based company, dedicates themselves to providing delicious veggie based meat alternatives for the vegan and vegetarian community in Chicago and abroad. They just celebrated their 10th birthday and certainly know how to turnip any grilling occasion. Their veggie burgers are one of the newest additions cropping up on their rotation. So you may wonder, how does Upton’s Naturals: The Classic Burger stack up? Beef (moooo)..maybe some hormones. We can’t guarantee anything. Vital wheat gluten, eggplant, water, tofu (water, soybeans, calcium sulfate), sunflower, canola or safflower oil, soy sauce (water, wheat, soybeans, salt), wheat flour, nutritional yeast, evaporated cane juice, onion, sea salt, garlic, natural hickory smoke concentrate, whole wheat flour, oregano, black pepper, paprika, parsley, marjoram and apple cider vinegar. Upton’s Taste and Texture: Upton’s Burger tastes a lot like their other seitan blends that we’ve had before. There is a slight smoke flavor with a peppery finish in the patty. 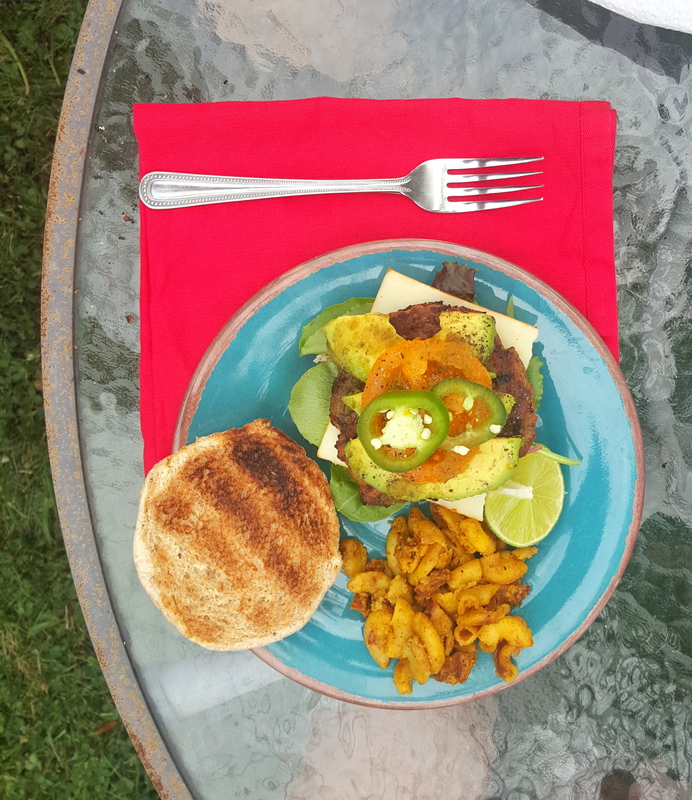 It’s a hearty veggie burger, not one of those ones that falls apart, and it easily cooks on the grill in a short time. Can’t beet a quick cooking meat free burger to get those planty vibes! So who won? Is this your garden variety knock out? Upton’s has less fat, calories, and cholesterol than than a traditional beef burger. It also has more fiber. Upton’s is kosher, lactose free and vegan so it digs away at different dietary needs. Note: Upton’s burger is NOT gluten free so traditonal burger takes the medal for that category. 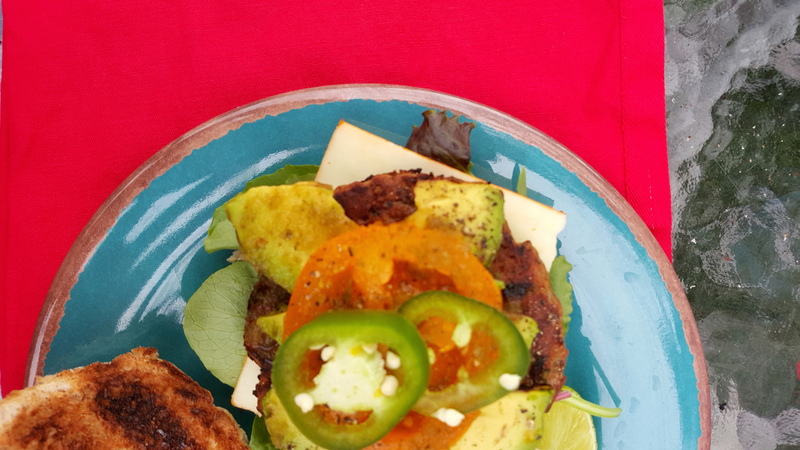 Are you ready for your BBQ guests to cheer “Olive Veggie Burgers!”? 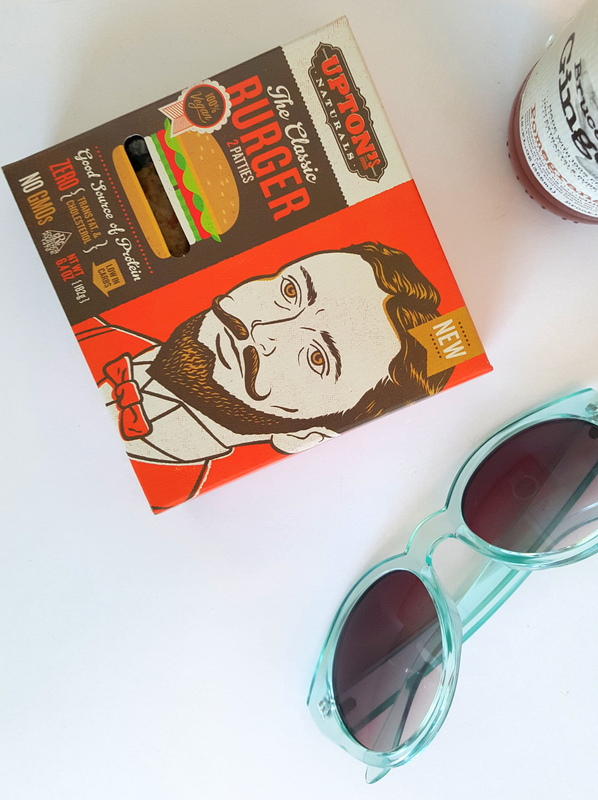 Upton’s Naturals’ Classic Burger is planting itself at natural retailers throughout the Midwest for $3.99 for a 2 burger box. Click HERE for a store locator. Swinging by the Chi? Sample the classic burger or many other vegan delights (jackfruit tacos, vegan bacon mac and cheese and more) at Upton’s Breakroom in Chicago’s West Town neighborhood. Visit www.uptonsnaturals.com and find @UptonsNaturals and @UptonsBreakroom on social media. 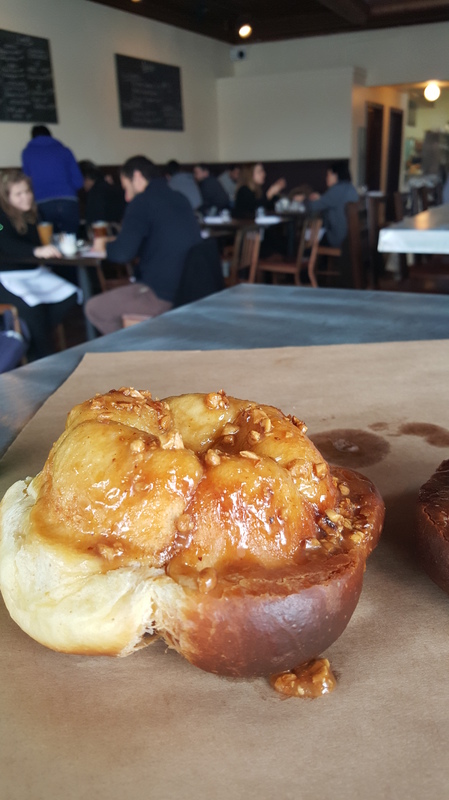 You relax with an espresso in one hand and a flaky croissant at finger tips reach. Sun beams on you as you slowly sip and watch the world go by. If you got no money for Europe but want to take a lunch mini vacay, Cafe Marie Jeanne is a tiny escape for your hour. 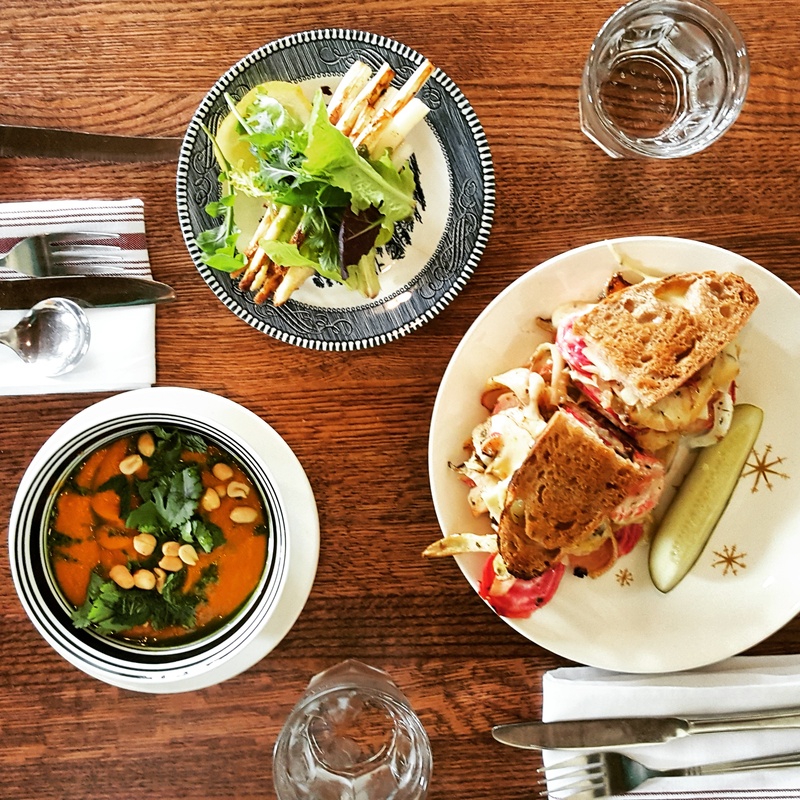 Only 6 months out of opening, Cafe Marie Jeanne is situated in a prime corner of Humboldt Park. This Parisian inspired cafe is nestled in a quiet yet booming restaurant area so you still feel serene when visiting. Executive Chef Mike Simmons, part owner, is an import from nearby Rootstock wine bar and yummy Lula Cafe in nearby Logan Square. The menu focuses on a la carte grab and go items mixed with more hearty lunch and dinner fare. Vegan and veggie options are available and there is a smattering of seafood for pescatarian as well. A small wine and cocktail menu make this an unharried bunch destination as well. 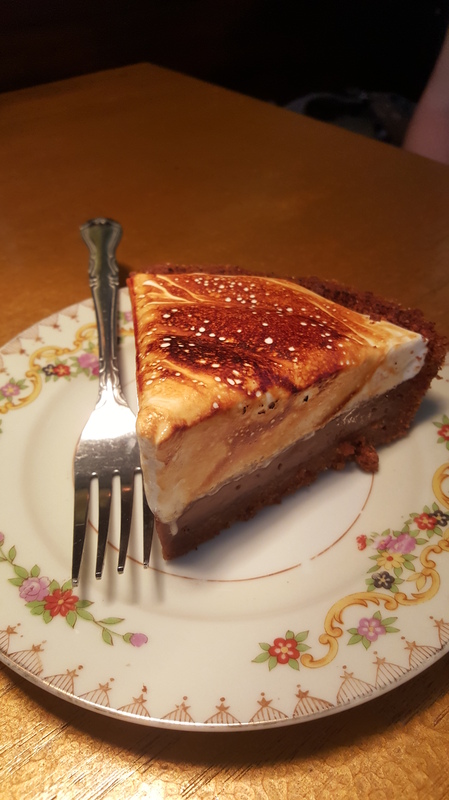 Don’t trust the menu online, however, as Cafe Marie Jeanne picks up local produce, thus switching up some of the offerings based on what is most fresh and seasonally tasty. We noshed on 3 different dishes to get a feel for their lunch service. April, with snow and rain, and even the first day of May have not been too kind to us Chicagoan. This steamy and creamy bowl of soup warms the soul with fragrant curry that tampers down the sometimes saccharine sweet potato. 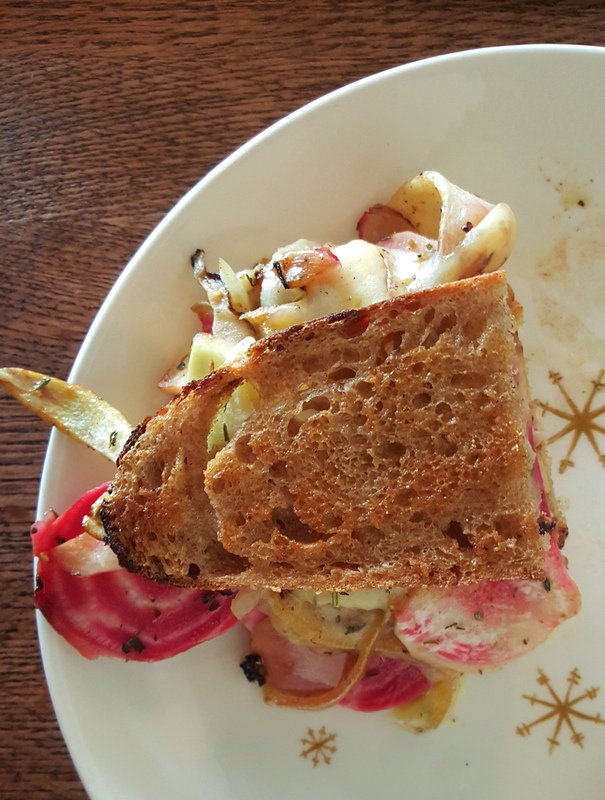 Our culinary pièce de résistance — Think of this as a fancy grilled cheese piled high with heart healthy veggies. Roasted root vegetables give the sandwich a savory and filling profile. The raclette, a semi-hard cow’s milk cheese, is a magic melter, giving the crusty homemade bread a smattering of delicious fondue like goodness. 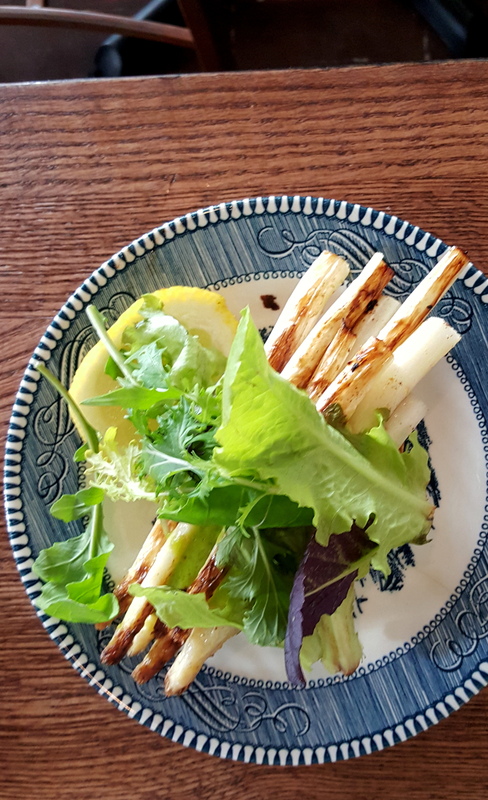 Funny story about white asparagus – many people don’t know it exists. It’s like a ghost veggie. Dig this weird veggie fact: white Asparagus lacks pigment because it is kept buried and deprived of sun, almost like it’s in a veg bomb shelter. The lack of chlorophyll gives it a pale complexion in addition to it being more tender and mild than it’s hulk counterpart. We liked the easy crunch of the asparagus but couldn’t taste anything outstanding in the hollandaise sauce. Side note: it’ll still make your pee smell funny. Quick tip: Looking to explore more than one spot in the neighborhood? Restaurant hop and grab a homemade piece of hibiscus key lime pie across the street at Spinning J, break out your cash and do a night cap at California Clipper or sip on more wine at Rootstock — all within walking distance! You know when you ask people where they live, and they say some far off burb’ and you cancel the possibility of visiting? Well, change your mind if they live in Northbrook and grab some brunch! Prairie Grass Cafe, conveniently located right off the expressway, will make you wanna visit your neighbor to the north. Chef-Owner Sarah Stegner and Chef-Owner George Bumbaris, both formerly of the fancy pants Ritz Carleton, partnered to created a casual environment with local fresh food. Stegner is also a 2 time winner of the ultra prestigious James Beard award so just think of the awesomeness of experiencing her cuisine without the abominable months’ wait of similar city joints. 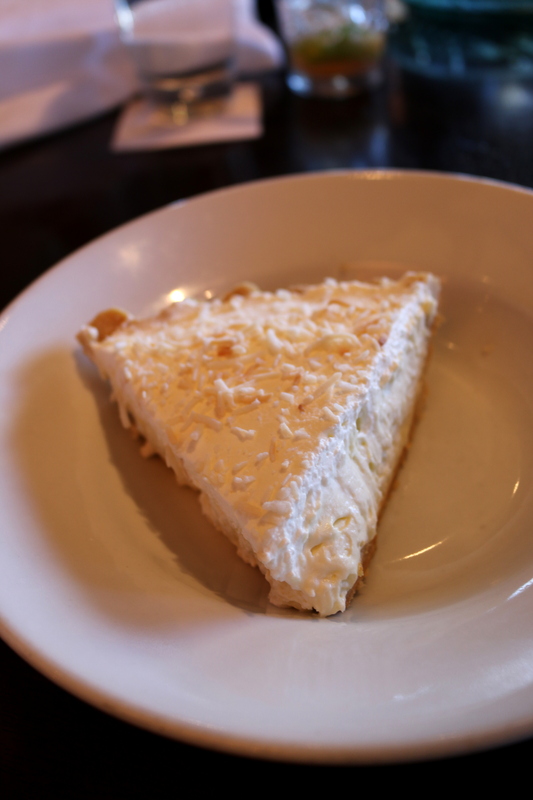 Prairie Grass Cafe hosted us one lazy Sunday afternoon to see what all the fuss was about. 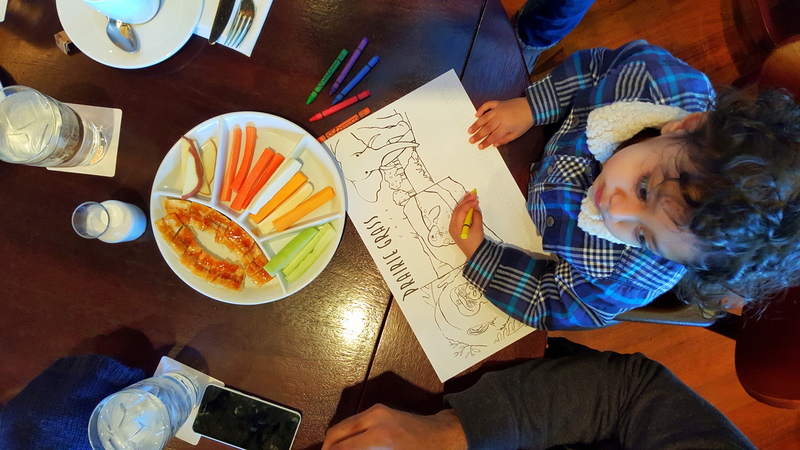 Prairie Grass Cafe was popping with kiddos during Sunday brunch, illustrating its’ kid friendly appeal. Stegner is a founding member of the Healthy Fare for Kids initiative which encourages restaurants to ditch the junk for children and provide them with nutritional sound menu items. The brunch menu for kids was comprehensive and our lil’ guest of honor, Monica’s nephew, scarfed down a cheese, fruit and veggie plate. Prairie Grass was able to work around his allergies with this dish. One small thing for improvement: as there were so many kids, there was no high chair available. We made due with a booster seat instead thanks to the help of our friendly wait staff but this might not have worked for a littler dude or dudette. Looking for more than just a meal? Check out “Make Your Own Pizza” Fridays where the toppings come to the table for a more active event for your tots. Pancakes can be a ho-hum or over the top in sugar at brunch. We flipped, however, over Prairie Grass’ fluffy light Lemon Ricotta Pancakes. 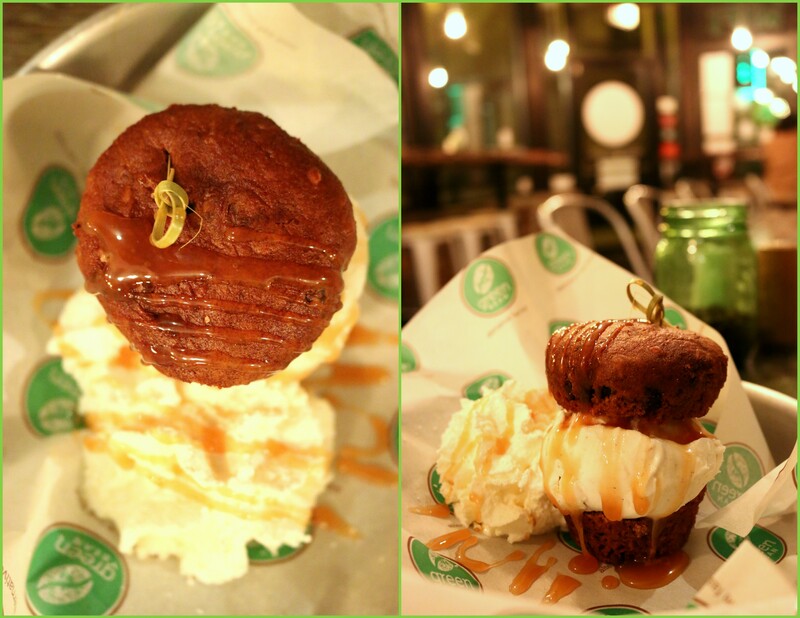 The citrus flavor measured up to our preferences and added a delicate sparkle to the cakes. Go for the gusto and add the berry flavorful rasberry sauce and creme anglaise for that WOW effect. We also sampled the french toast and although it was decent, the Lemon Ricotta Pancakes take the taste award. 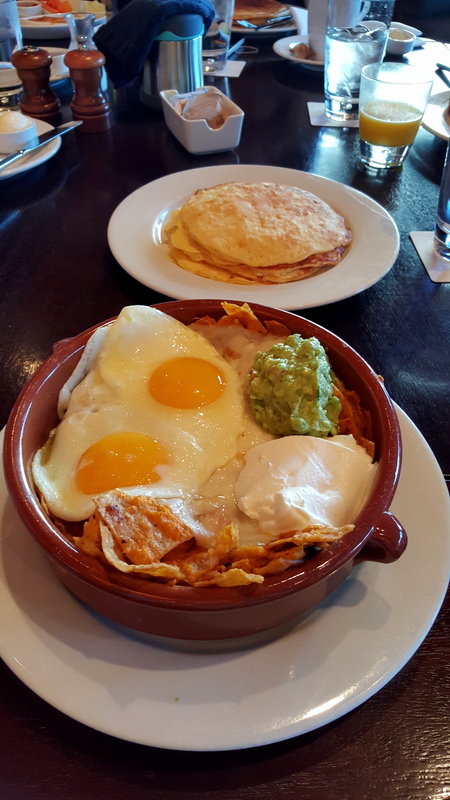 The Chilaquiles will make any tummy happy with runny soft fried eggs melting over the top of a hearty pile of cheese, crispy beany tortilla chips, guacamole and pico de gallo. 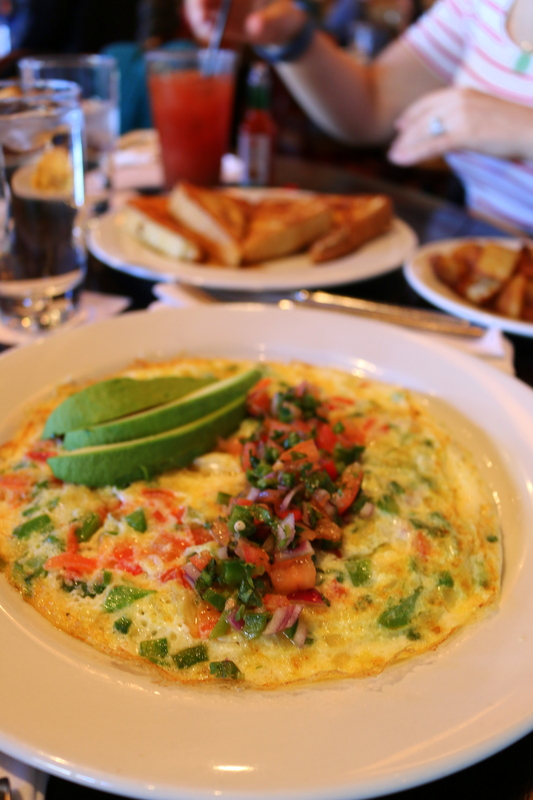 The Egg White Omelette is chock b’gawk full of farm fresh eggs, seasonal produce and topped with avocado and pico de gallo. We added a side of perfectly seasoned crispy potatoes to round out the meal. 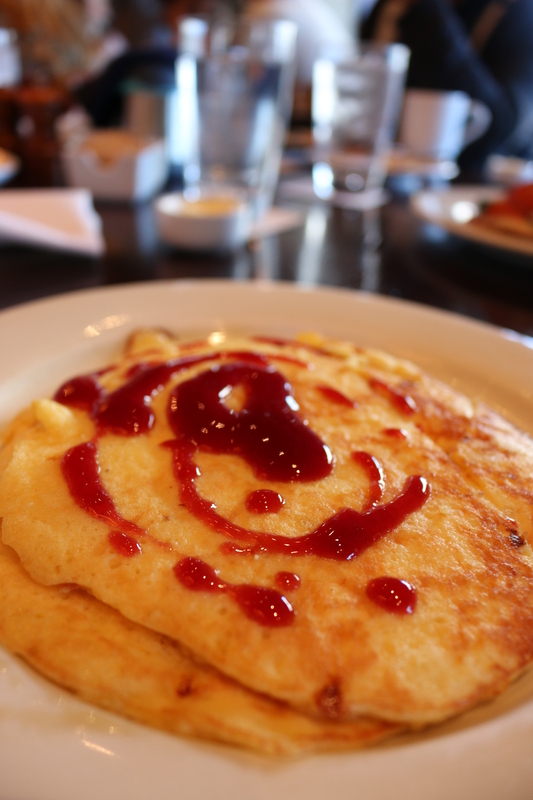 This omelette is big enough for 2 people so feel free to split. 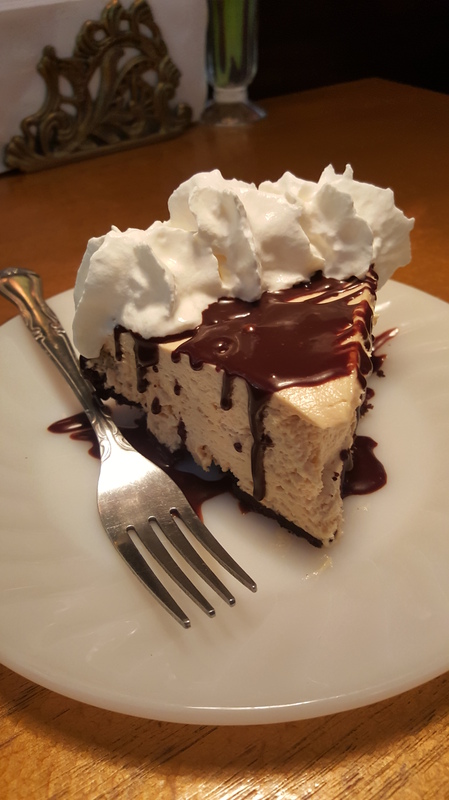 Prairie Grass Cafe is a dessert lovers’ dream with their bountiful selection of fresh homemade treats. 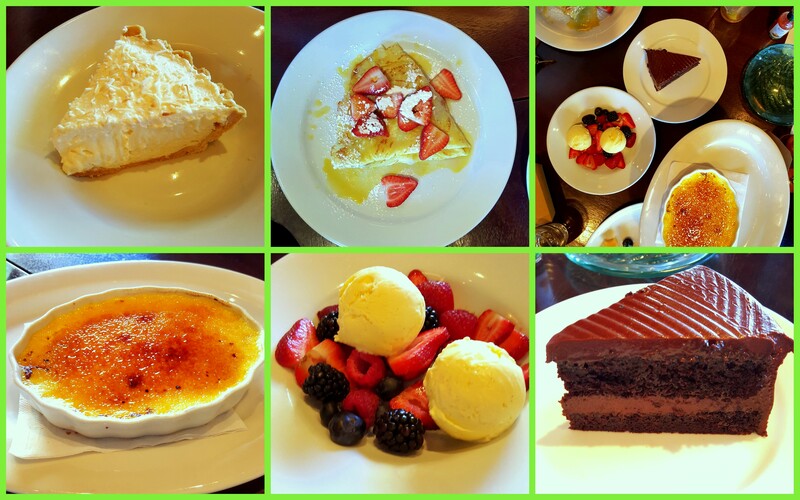 Chef Sarah spoiled us sweetness with the Coconut Cream Pie (seasonal), Double Chocolate Cake, Vanilla Bean Creme Brulee, Homemade Vanilla Ice Cream with local berries, and Strawberry crepe with grand mariner sauce. Chicagoans, if there was ever a reason to meet your suburban friends half-way, this is a reason to venture beyond the borders of our city. Not feelin’ the brunch buzz? 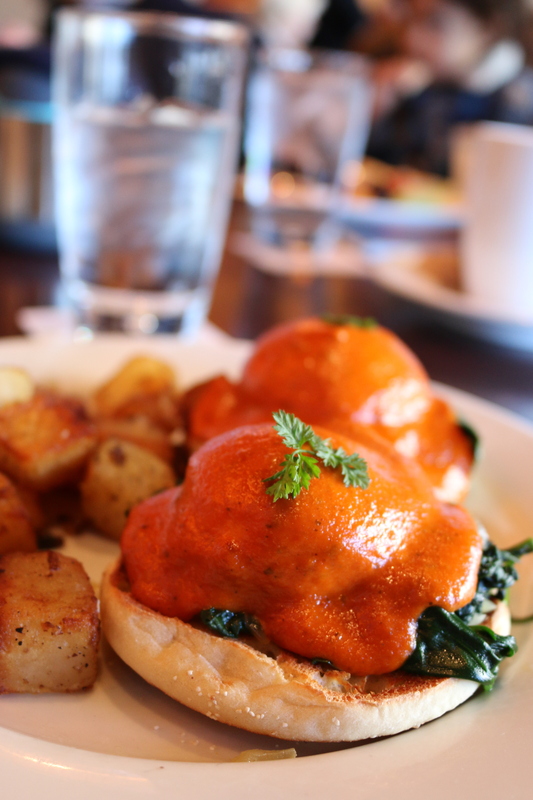 Get up later for lunch or dinner at your wake up whims. It’s not often that healthy and fast food share the same title but magic is possible. Behold, we hath found a restaurant that aims to do both (oh and its yummy, princes and princesses). 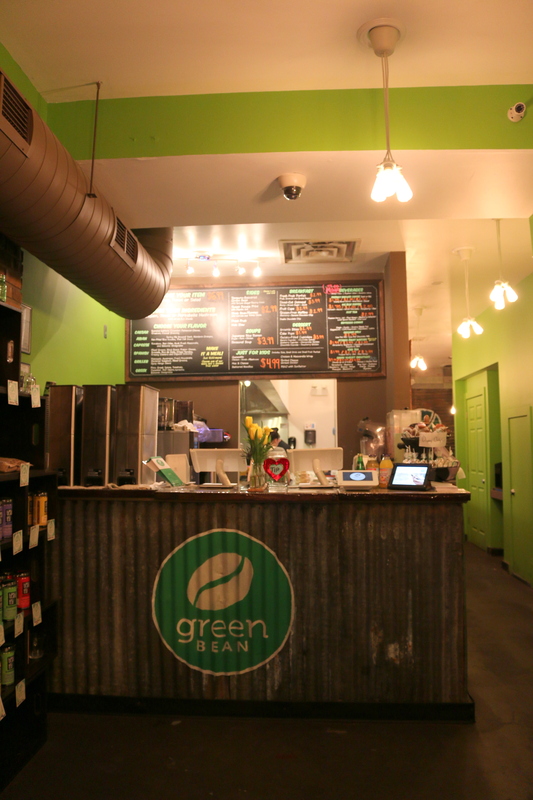 We know there’s a few chain healthy alternatives in Chicago but none are 100% gluten free, GMO free and free of common allergins (no nuts, coconut or chickpeas) like the new Green Bean Chicago. It’s not often that you learn about the passion behind the restaurant you are eating in either. Owners, Executive Chef Mike Watson, Aaron Bush and investor and dietary manager Srinivas Ravanam partnered on this daunting culinary adventure for many reasons. Mike thinks about the health of his children and how fast food often targets them. Aaron works in the health and wellness industry across the state and sees how limited healthy food availability affect people throughout Illinois. Both wanted an affordable fast healthy option for working families. Both strive for a healthier tastier lifestyle for themselves. We received free samples of their menu for review. All meals (entree, a side and a drink) are balanced to run around 500-600 calories. 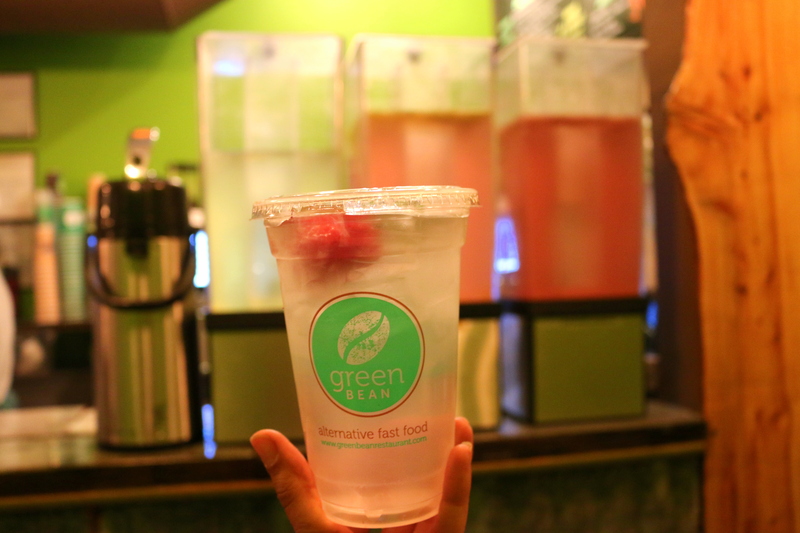 There is NO soda at Green Bean but instead homemade stone fruit waters are provided for the combos. Price point runs about the same as a Panera, Chipotle or chain greasy fast food meal, around $8-$9 for a meal. Kate is sensitive to gluten and has tried gluten free wraps and breads before. Some good (Udis), some not so good (some kinda yucky wrap). Chef Mike’s personal gluten free bread and wrap recipes (a mix of tapioca and rice flour with extra love) don’t seem “gluten free”. Both were hearty and satisfying. Take us to flavor town! Monica noted the sweet potato fries were delightfully crispy. Chef Mike explained they are made fresh 4-5 times a day…no preservatives here peeps. She also adored the salted caramel melty creamy gelato. Kate was stuffed to the brim by her chicken caprese panini and, although she doesn’t normally get the feels for mushrooms, these ones were garlicky, juicy and free of that sometimes unpleasantly earthy flava flav. No complaints at the taste office here. 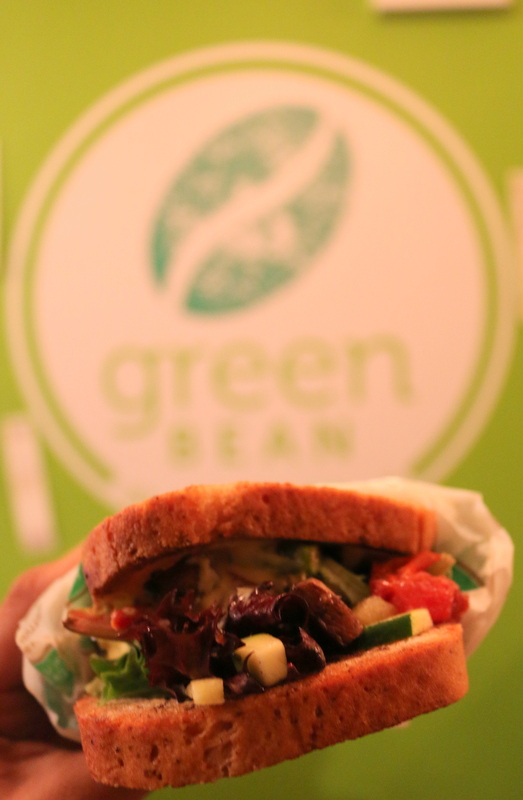 We highly recommend Green Bean. It’s health conscious, allergy friendly, and you get your monies worth. 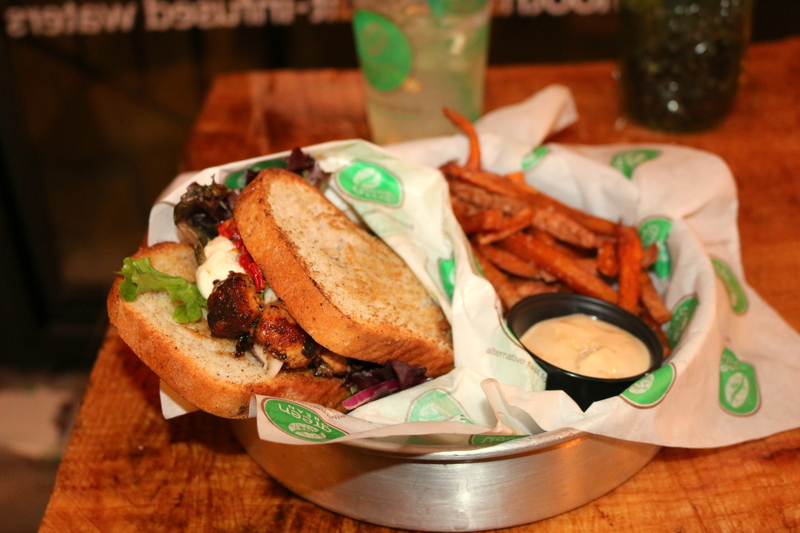 Fun Foodie Fact: You can get breakfast or lunch/dinner ANY time (for you brunch cravers). It’s also awesome if you have a social group with dietary needs. You can bring your diabetic dad, celiac sister-in-law, and nut allergic nephew all to the same place! 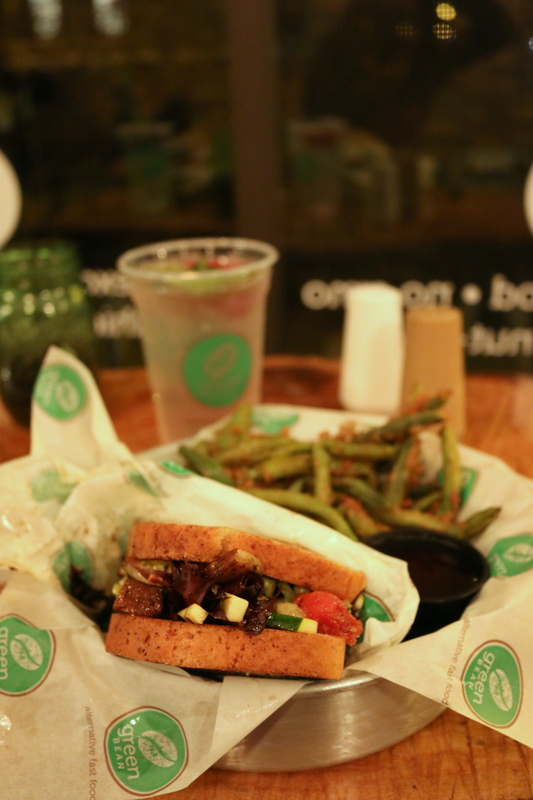 Green Bean is expanding to Schaumburg (yaya suburbanites!) and plans to franchise in future locations. 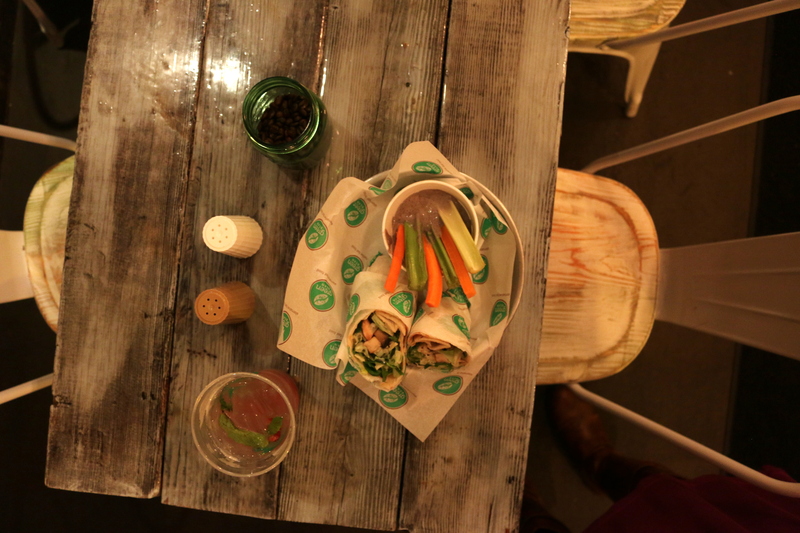 So lighten up and head to Green Bean when you’re in the mood for a healthy and quick meal! We have ambitions of getting in touch with our inner culinary geniuses every week when we head to the grocery store…and then we end up passed out on the couch with a half eaten Morning Star Burger falling out of our hands after work. Like it or not (who really likes it), American culture is one of the most overworked cultures in the world. We need a break! Don’t you often muse about have your own personal chef? Chicagoans, rejoice! There is a pretty fantastic option for you to get your personal chef wishes fulfilled, even without a genie! 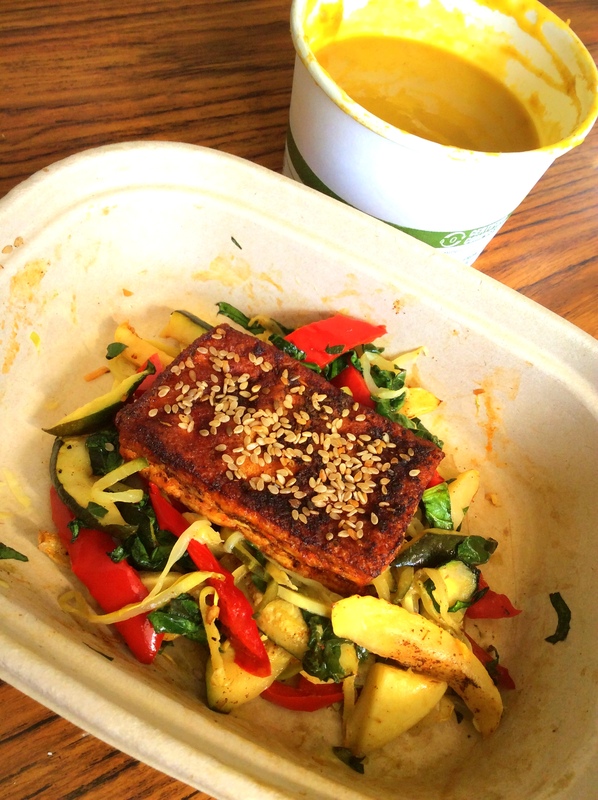 We were so excited when Erin Winston Silva, the co-founder of Cooked, reached out to us to sample their pre-cooked meal delivery options. 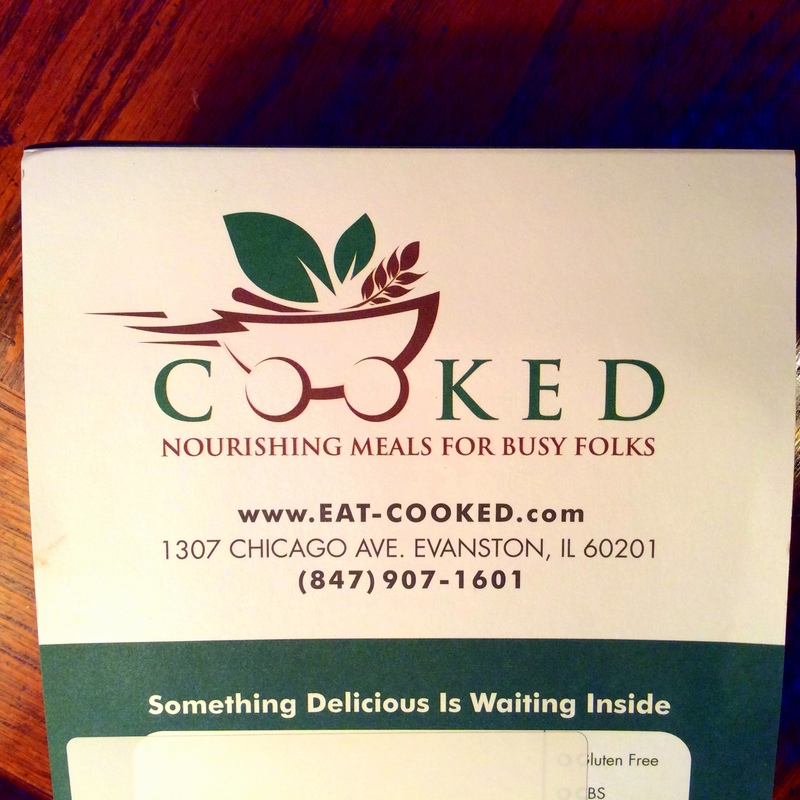 Cooked promises “Nourishing Meals for Busy Folks” and we are 2 very busy ladies so we jumped on the opportunity. We were particularly intrigued as Cooked seemed to have more veggie options than many delivery services that we’ve seen. We also love the values of the organization. Chef Jona Silva’s own health journey inspired him to create local and nutritionally rich (not calorie rich) foods to promote wellness in others. 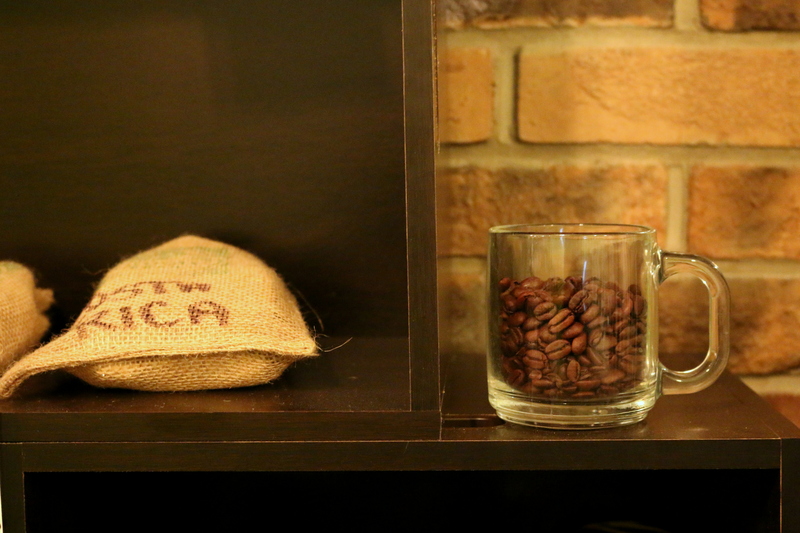 One can tell from menu offers, which change weekly, as well as Silva’s transparency in where ingredients come from. The focus is local partnerships and he is also sensitive to food allergies like gluten or dietary preferences like vegan, vegetarian and T-Rexian. Ok, enough blabbing, we know you wanna know what you get to eat! For $76 (tax and delivery included) dollars, we got ALL the foods below!! Delivery was timely and Erin was available throughout to deal with a multitude of blogger questions like: “What about Monica’s chickpea allergy” and “Can you change our delivery date? We forgot, we won’t be home!”. Loved it! It was refreshing and green-licious with kale, romaine, spinach, coconut water and a sweet touch of pineapple. We split this, yet there was enough for a full lunch for both of us. This puppy is only $5 and is rich in superfoods like quinoa, amaranth and other ancient grains with mysterious origins. The salsa added a nice kick to the mix. Again, the portion was plentiful. 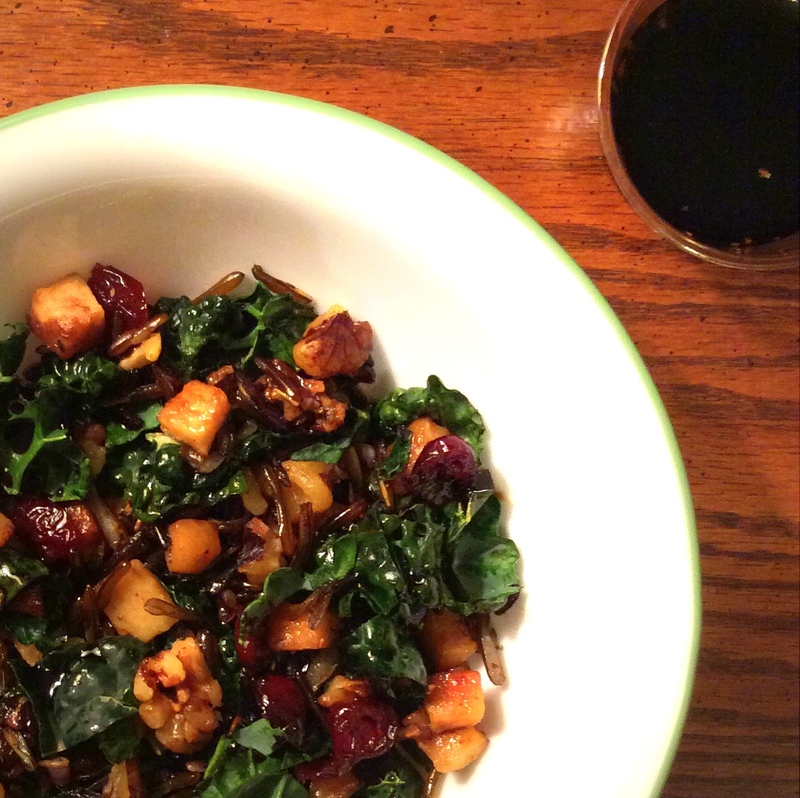 We enjoyed the sweet touch of cranberry and the kale and rice mix was tender and garlicky with a rich balsamic dressing. 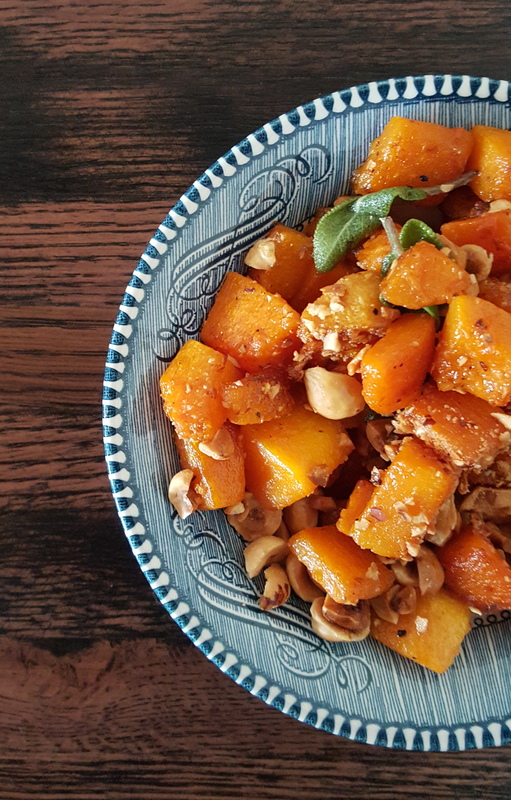 Admittedly, we had to google what the heck a kabocha was. Turns out it’s an Asian winter squash! 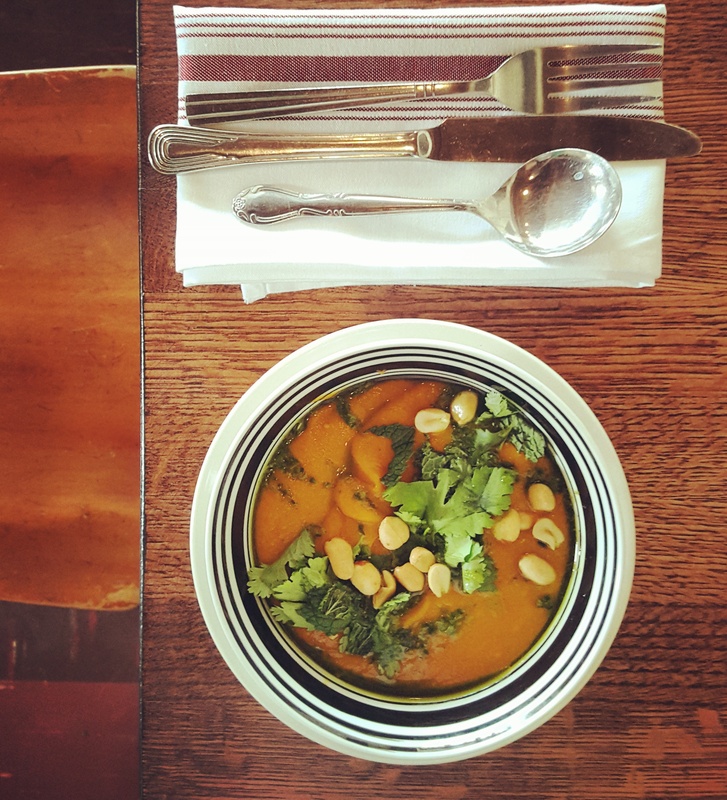 Last week’s weather was considerably still miserable so this warm rich soup hit the spot. It reminded us of a sweet potato bisque with light creamy touches of spices and cinnamon. The 2 tofu cutlets came with zuccini noodles and vibrant red and yellow peppers, dressed with a light a soy sauce. Cauliflower is a vegetarian delight as it has a chunky texture. 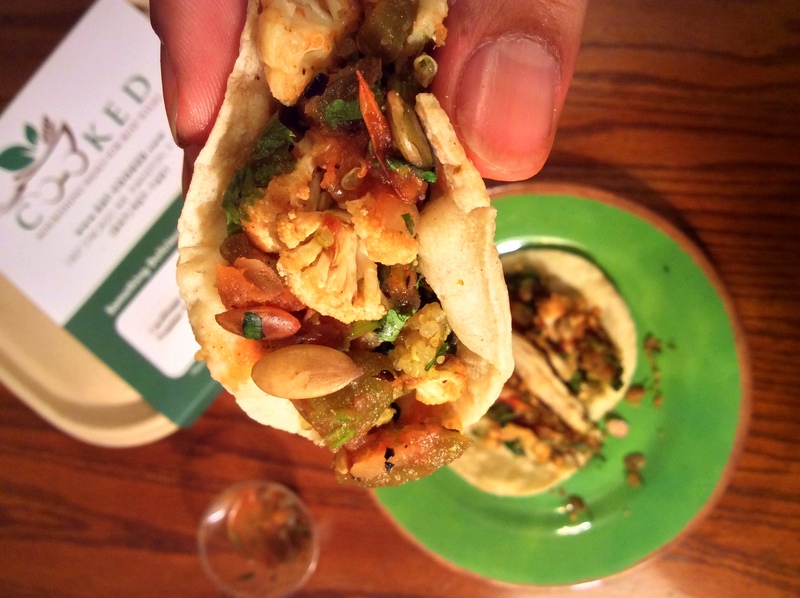 The taco mix also included cilantro, quinoa, and pumpkin seeds with a side of fresh salsa. The squash and broccolini looked ultra fresh and colorful with bright orange and green hues and they were both cooked to perfection. 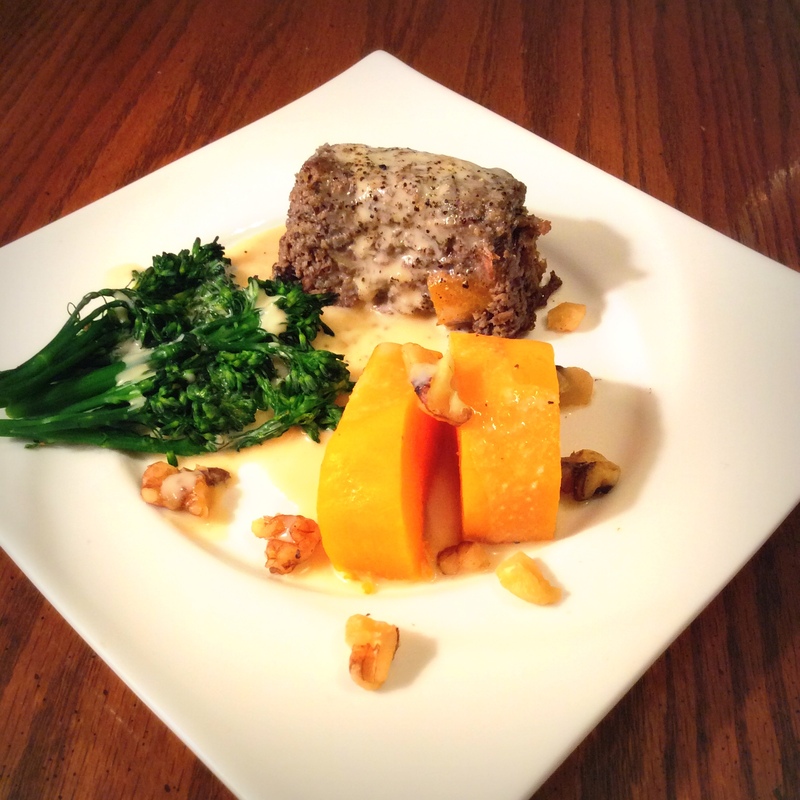 The walnut loaf was a gray meat like color and was hearty for those of you who are familiar with the texture of meatloaf. 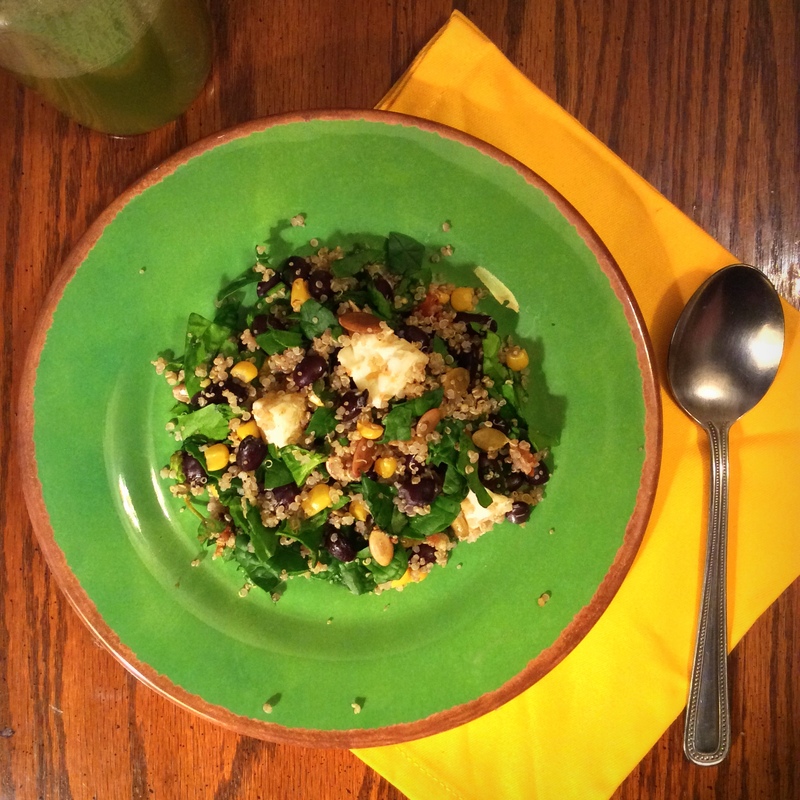 We really liked the dressing that was provided and it seemed like it had a tahini base. The meals are supposed to stay fresh for 3 days but we stretched them out until Thursday and basically had enough deliciousness to stave off any grocery shopping for 2 people for the work week. It was like a cooking vacay! We highly recommend Cooked. Meals change weekly to provide variety. This week features a tantalizing coconut dal (aka lentils) and chickpea zuccini fritters. Ready to order? All Chi Organic Girl readers can get 10% off their first order with the promo code: chiorganicgirls so skip the shopping this week and eat cooked! *We were not compensated for our opinions but were provided with a gift card to try Cooked meals.